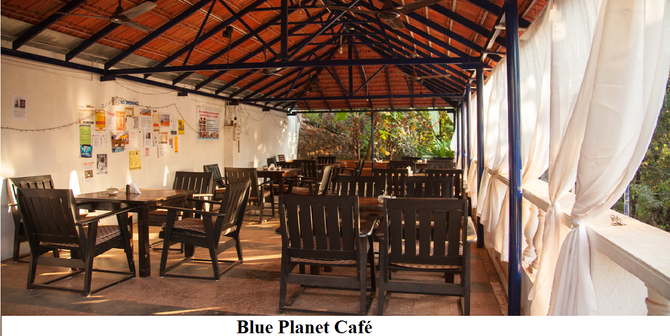 Pravin and Urmila Desai are the husband and wife team behind Planet Blue Café situated in the scenic locale of Agonda. Pravin possesses the true spirit of an entrepreneur. He has dared to set foot into an area that could either make or break a restaurant based business. In a place like Goa, where rice and fish curry are still the staple diet of most natives, Pravin, a Goan by birth, has risked a great deal in setting up a health food restaurant. The son of a fisherman to boot, he has fallen quite far from the proverbial apple tree. But the fruit of his labour is evident in the success of his restaurant, albeit thanks mainly to an international clientele. This thirty eight-year-old moved to Canacona from Colvale about sixteen years back because of the beautiful environs. After having worked in various restaurants he decided to set up his own and indulge his need for creating healthy recipes and protecting the environment. He says, ‘It’s not just a business but a passion.’ Along with his wife, who is also his partner chef and shares his vision wholeheartedly, he has put together a menu that caters entirely to vegans and vegetarians. Unfettered by conventional training, his ideas are refreshingly original and palatable despite the absence of meat, dairy products and eggs. 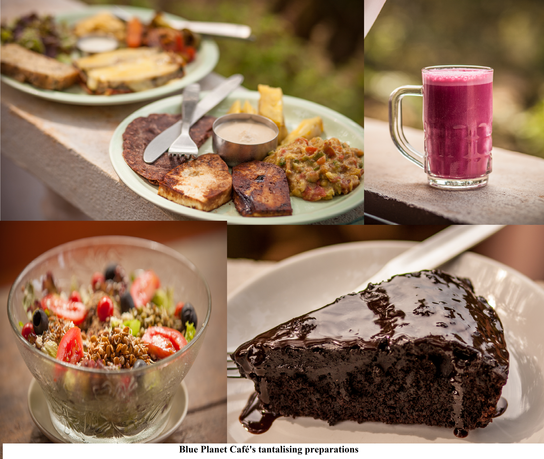 The concept of veganism, which goes a step further than vegetarianism by eschewing other animal derived products besides meat, was not all that popular when Pravin opened Blue Planet Café in 2001. His main aim was to avoid cruelty towards animals and promote healthful dietary habits. It is the Western world that follows veganism more while in India it is a struggle to educate people about the value of this sort of food. He explains, ‘Indians do not realise the impact of oily and fast food on their bodies.’ He talks of an incident where a customer complained about the absence of meat in the restaurant’s menu. It just proves how unaware we are of the value of healthy food. Pravin’s philosophy in terms of the impact of the food one consumes is that it can affect your overall well-being, including your mental and emotional states. He believes that the cruel act of killing a chicken or any other animal somehow transfers negative emotions onto the consumer of the flesh. He claims uncontrolled anger, rapes and other crimes are a result of the effects of what people eat. ‘When people eat right, they do the right things,’ says Pravin. People from the Western world have drawn to themselves what is good and beneficial in our Indian culture but we make poor choices and opt for the worst of Western food culture, that is, junk food. Pravin and Urmila do their best to invent new recipes quite unlike the quintessential Goa cuisine. Their preparations are a fusion of the East and the West with as little oil as possible, raw ingredients and vegan food. Some of their vegetarian dishes are: spinach, mushroom and cheese fritters served with a tomato feta salad, mashed sweet potato, brown bread and cashew butter and vegan mayonnaise; spinach lasagna served with a mixed vegetable stir fry, organic green leaves, bean humus, brown bread and vegan mayonnaise; and pumpkin cheese fritters served with carrot beetroot and orange salad, cumin potatoes, garbanzo humus and sour dough. Their vegan concoctions to please the palate include fried tofu served with peanut sauce, organic boiled sweet potato, guacamole and gluten free bread and steamed broccoli served with jungle coconut rice and avocado cream. Besides these there is an array of salads, juices, smoothies, shakes and other dishes to tickle the taste buds of the epicure. Pravin takes particular delight in coming up with new recipes for juices, smoothies and shakes. The menu tends to differ depending on the availability of certain food items because the Desais rely only on seasonal produce that is grown locally. Pravin says, ‘We try to get as much organically grown vegetables and fruit as possible. We use local produce with less chemical fertilisers and we avoid gene modified food.’ Husband and wife work personally in the kitchen, seeing to every last detail to make sure everything is to their customers’ satisfaction. Blue Planet Café stays true to its name in maintaining strong leanings towards safeguarding the ecological balance of the planet. Items like paper, glass, printer cartridges, electronic equipment, batteries, furniture, linen, wine bottle corks, etc. are re-used or recycled. Individually packaged products, such as jams, will not be found in their kitchen. Instead, locally made items or those cooked by the café’s chefs are used. Some portion of their grounds has been used to encourage wild flower growth which in turn would lead to the flourishing of various species of butterflies and moths. Blue Planet Café also welcomes suggestions to inspire their endeavour to save the planet. There is also the Blue Planet Wellness Retreat in addition to the café. It is located on a hill above the café. There are five cottages constructed to ensure the comfort and safety of customers. Here, customers can avail of yoga lessons to complement the healthful diet provided by Blue Planet Café. There are plans to open a heated pool for an aquatic bodywork session. 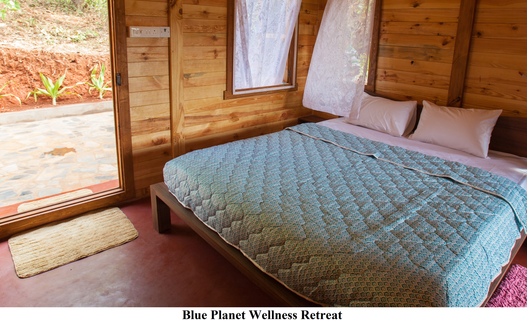 More information about Blue Planet Wellness Retreat is available at www.retreatgoa.com.